The village of Agia Pelagia, once the site of an ancient Greek city, is situated in a bay 20 kilometers northwest of the capital Heraklion, and set 4 kilometers off the main road. 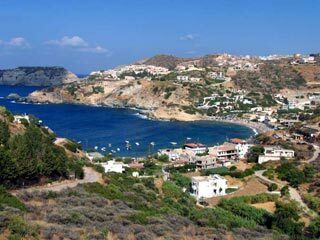 The name Agia Pelagia derives from a monastery 1 kilometer west of the bay. It's a haven of peace compared to some of the other beachvillages that are sometimes placed directly next to the mainroad itself. Agia Pelagia is actually more like a cluster of small villages and beaches, the main beach being the most eastern one, decorated with a small 'boulevard' with restaurants, cocktail bars and a supermarket.